Aidan Finn, MVP, has been working in IT since 1996, as a consultant, systems administrator, and in technical pre-sales. 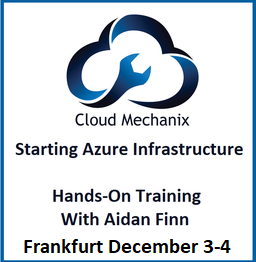 Currently he works as the Technical Sales Lead of a technology distributor in Dublin, Ireland, where he evangelizes and educates Microsoft partners about Microsoft technologies such as Azure, Windows Server, and Hyper-V. Over the past 3 years, Aidan has written custom Azure IaaS training to enable Microsoft partners in Ireland to grow their cloud business, focusing on technical enablement. Aidan has been awarded the Microsoft Most Valuable Professional (MVP) designation by Microsoft in recognition of his community contributions for the last 10 years. He currently has a dual expertise of Cloud and Datacenter Management expertise (Hyper-V, Windows Server, and more) and Microsoft Azure. He previously held a System Center Configuration Manager MVP expertise. Aidan has spoken at numerous events in Europe and the USA, including community briefings, Microsoft regional events, Windows launches, and conferences such as E2EVC, TechEd Europe, and Microsoft Ignite. Aidan blogs on AidanFinn.com about Microsoft infrastructure solutions, with focus on Hyper-V and Azure IaaS. has also written articles for various technical sites and is a contributing editor on Microsoft virtualisation for the Petri IT Knowledgebase. You can follow Aidan on Twitter (@joe_elway) or on Facebook. 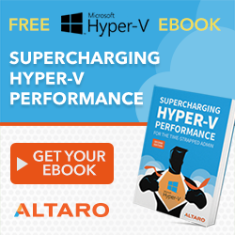 Aidan is the lead author of Mastering Hyper-V Deployment (Sybex, 2010). He is one of the contributing authors of Microsoft Private Cloud Computing, Mastering Windows Server 2008 R2 (Sybex, 2009), Mastering Windows 7 Deployment (Sybex, 2011), and Windows Server 2012 Hyper-V Installation And Configuration Guide. Aidan lives in the midlands of Ireland with his wife and family. When Aidan isn’t at work he’s out and about with camera in hand trying to be a photographer. I do not work for Microsoft. If you’re just taking a quick dip into this blog and see something that is pro-Microsoft then it is because I really feel that way. We MVPs are meant to be independent experts. I neither get any payment for Microsoft nor do I own any Microsoft shares. Dig a little deeper on this site and you will find that I am critical of Microsoft and I disagree with them on things from time to time , and my independent comments occasionally upset a few blue badges in Sales & Marketing – just remember that you don’t have to like everything on the menu to like the restaurant. I do work for a Microsoft distributor, specialising in and selling the technologies that I focus on. I blog about what I have chosen to work with. There is no agenda. I do work with Microsoft from time to time on events, or product feedback. In the long run, I hope that helps improve knowledge of or quality of products for the end user like you and me. Am I available for Work, Events, Publicity, etc? If you have a genuine inquiry then you can email me, or you can follow me on Twitter and Facebook. Keep in mind that I am in Ireland in the UK/Ireland timezone, and that I am busy, so I might be slow to respond. No exceptions, no matter how exciting you think you, your company, your product, your service, or whatever is.